How to Solve "iTunes Cannot Read the Contents of the iPhone" Error? Is "iTunes cannot read the contents of the iPhone. Go to the Summary tab in iPhone preferences and click Restore to restore this iPhone to factory settings" message also driving you crazy? If you think what iTunes suggests is the only solution and incautiously click the OK button, you will find that you have made a wrong choice. Once you restore, your iPhone will revert to the factory settings and become totally blank. That's really not wise, but how to solve iTunes cannot read iPhone contents without losing precious data? No need of iTunes, no worry of iTunes corrupted files. Why "iTunes Cannot Read the Contents of the iPhone" Error Happens? There is actually no official explanation from Apple why this error message pops up often, but from iPhone users and some communities we have found some possible reasons causing iTunes cannot read iPhone contents issue. Occasionally this problem happens especially on jailbroken iPhone, iPad or iPod, and when contents on iPhone are written improperly. The corrupted or broken iTunes database file is also a cause disappointing iTunes to recognize iPhone contents. Whatever reason is, the final purpose is to find a way to fix iTunes cannot read the contents of the iPhone of course. How to Solve "iTunes Cannot Read the Contents of the iPhone" Issue? Method 1. This error message doesn't tell a way other than promoting you to restore your iPhone. So, if you do not mind to wipe clean your iPhone and remove all data, you can just do what iTunes tells you to do. However, we still suggest you to backup iPhone first in case that you lose anything important on your iPhone. Notice: You may find that this is not a once for all solution, because it still happens later. First, make sure you have the latest iTunes installed, if not, check for update. If you already have owned a newest iTunes especially on Windows, you can completely remove iTunes and corresponding components like Apple Application Support, Apple Mobile Device Support and Apple Software Update, and then reinstall a new iTunes. Then, reboot your computer and USB-connect your iPhone to computer again. If it still fails to work, try the following iTunes alternative for Windows 10/Mac to fix iTunes cannot read the contents of the iPhone in a much easier manner. iTunes is indeed the official way but not the only way for you to read iPhone contents on computer. Actually besides iTunes cannot read the contents of the iPhone error, iTunes has been notorious because of various problems like iTunes won't backup iPhone, iTunes not recognizing iPhone iPod and iTunes crashes when syncing data. No matter you want to explore the files in your iPhone or transfer iPhone music, photos or videos, iTunes is not that considerate. So, iTunes alternative is a good choice when you are getting tired of iTunes. DearMob iPhone Manager is as of now the best iTunes alternative for Windows and Mac even outshining iTunes regarding its bulk-backup and media transfer features. 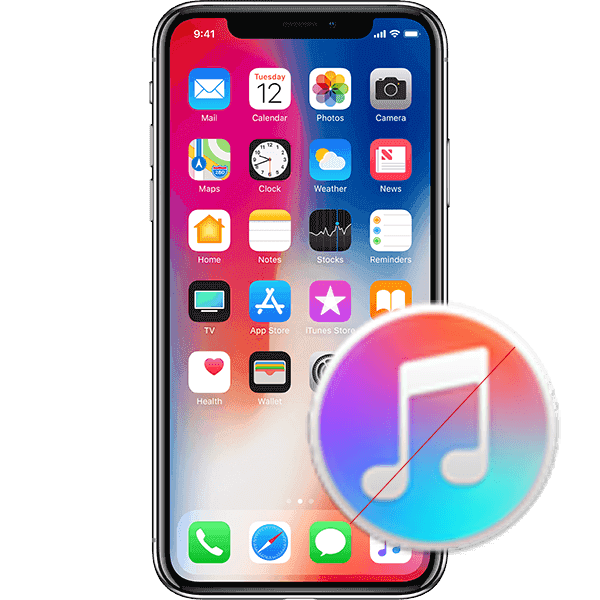 To solve iTunes cannot read the contents of the iPhone, DearMob iPhone Manager provides a more direct and visual way to let you manually browse iPhone data files at will, reaching every corner of your iPhone. At the same time, it replaces iTunes as the best iPhone backup software with U.S. military encryption method to safeguard your data during transferring and sharing. Compatible with 12 types of iPhone iPad data, you can manage and transfer iOS photos, music, videos, messages, files, etc at will. How to Solve iTunes Cannot Read iPhone via DearMob iPhone Manager? Assuming that you have installed DearMob iPhone Manager on your computer, if not, just click the download button below, and now let's start using DearMob iPhone Manager to solve "iTunes cannot read the contents of the iPhone" error and manage your iPhone data at will. Each types of iPhone data is viewable and operable with DearMob iPhone Manager. Just click on the specific type of your data and have a full management of your iPhone contents. Tired of the way using iTunes to sync iPhone data? 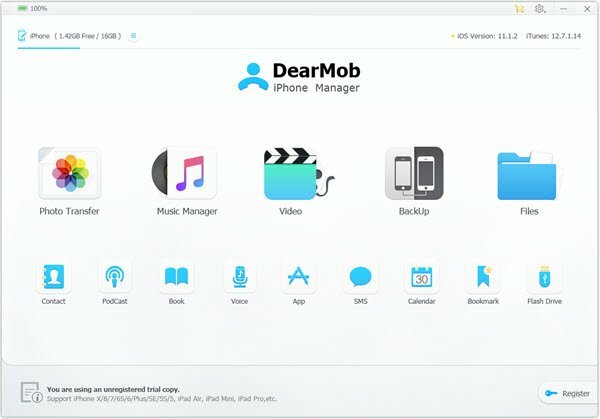 DearMob iPhone Manager offers an easy way for you to choose specific data files and transfer them to computer one by one or in batch. As the best iTunes alternative, DearMob iPhone Manager can one-click backup iPhone and encrypt the data files in a password-protected way. If anyone of you needs to backup a single type of iPhone data like photos, videos, calendars, messages, DearMob iPhone Manager would do you a favor. Encrypting private photos, secret videos and important contacts you export from iPhone is also supported by DearMob iPhone Manager.